My writer person (Janet Cantrell aka Kaye George) is very busy working to bring you a new series next year. But in the meantime, she and I both want to tell our readers how grateful we are for their loyalty. I know, I’m a cat, and I don’t express gratitude well in person. But on the page I can be myself, right? In spite of our publisher pulling out, our books continue to sell and to get new readers. If you haven’t read any Fat Cat books, my writer has agreed, after I convinced her, of course, to give some of them away. So, while Lyrical Press and Kaye George are getting REVENGE IS SWEET, the first book in the Vintage Sweets cozy series, ready, I’m still available for your reading pleasure. You’ll love me. I’m handsome, intelligent, and…if you have any treats, I won’t say no. This is Janet speaking. This series has been discontinued, but if you missed them on the first go-round, I’d like to fix that! 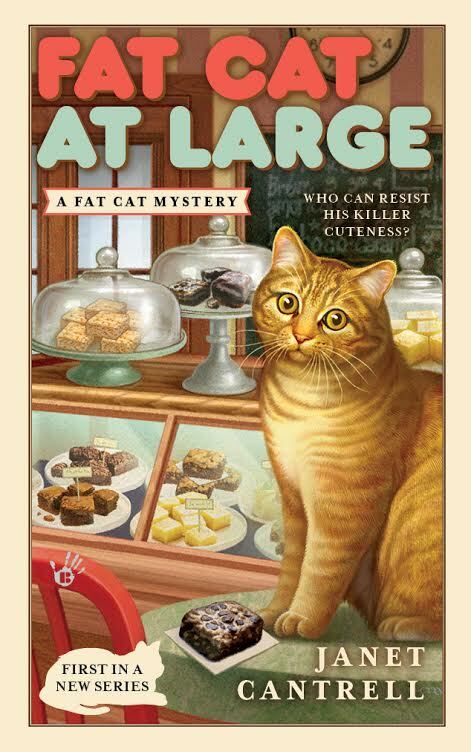 In the festive spirit of the season, I’m giving away the whole series, all three books: FAT CAT AT LARGE, FAT CAT SREADS OUT, and FAT CAT TAKES THE CAKE. Please leave a comment below, including your email address and I’ll pick a winner at the end of Wednesday, the 6th. (Not the 7th as originally posted!) I plan to peek in here around midnight EDT. THANKS AGAIN FOR ALL THE SUPPORT MY READERS HAVE GIVEN THIS SERIES. HERE’S TO MORE MYSTERY FUN IN 2018! Happy Holidays. Looks like it was s great series. Thanks for having this great giveaway. I am so sorry Fat Cat is being discontinued especially with such a large, devoted following. The same thing has happened to several of my favorite authors and it's heartbreaking. However, I agree that Revenge is Sweet!!! mlarkin (at) rmrgroup (dot) com. I'm already missing these wonderful characters! bobwiesmann (at) gmail (dot) com. My own Fat Cats and I would love to have the complete set. The copies I have are well worn and a bit beat up. Thanks for the chance to win some books. Looks like a great fun series! So sorry to see the series go! I have a plump cat myself. I always wanted to read this series but never had a chance to. I would love to win. Thank you for the chance. I am constantly amazed by the short-sightedness of publishers. What happened to a cat's 9 lives? I often wonder why a publisher would cut a series so short. I haven't read this series yet, but I've read great reviews of the series. Would love to read the series. My Malachi Fat Cat would love for me to read this series to him. I think Quincy could be his long lost brother. Thanks for the chance to win it. I'm sorry that the series has ended. Thanks for the giveaway! Oh, Honey! Sorry to hear they were cancelled. Would love to read. Thank you for the chance to get these. 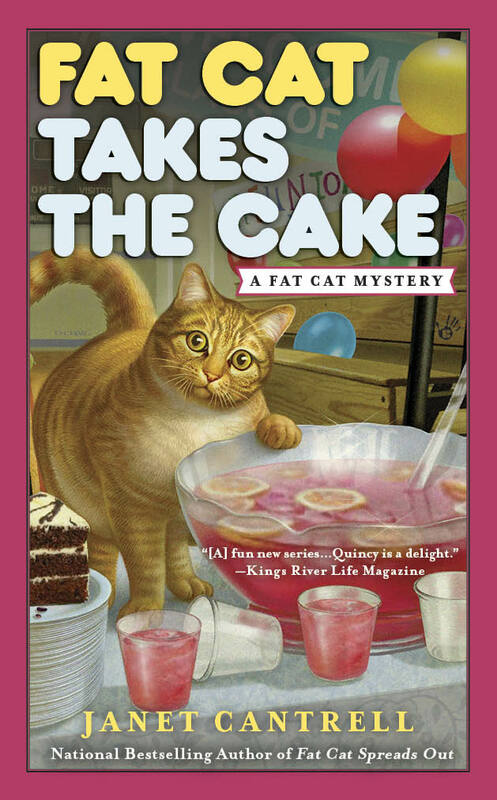 Thanks for the chance to win a set of the Fat Cat mysteries. Sad that the publisher discontinued the series. Looking forward to reading the first Vintage Sweets cozy. I'm hoping you'll appear in another book or series at some point in the future. My 5 cats with you and yours a happy holiday season with lots of good eats! It would be marvellous to have the entire series. Thank you. Haven’t read this series yet. That’s the important word! YET. It’d be great to win the three book series, but if not, I can head to the library. Those publishers! What do they know, anyway? Thanks for your generosity. Happy Holidays ������lldawnjm(at) gmail (dot) com. These were next on my to be read books, but had to finish three others before I used my gift card to buy them! As the owner of several(6) fat cats, I was anxious to read them! I would like to read this series. I have to get my cat fix in books since hibby is allergic to them. My granddaughter also loves cats, so I will let her read the stories also. I only had the pleasure of reading one from this series and absolutely loved and enjoyed it. Would love the whole set. Thank You for the chance!! I am heart broken this series has been cancelled. It is a favorite. Thank you for a chance to win the whole series. I would love to win these books. Thanks for your generous offer and the opportunity to win. Best of luck with the new series. Will be looking for it. Thank you for the generous give away! Sounds like a good series and leading character...Fat Cat! Sorry to hear they canceled your series. I wish you all the best with the new one! I just found you and I'd love ro win! That Cat has the cutest expression on your cover. Love to have the series thank you for any chance. I haven't had the chance to read this series yet. They sound purrfect. Thanks for the chance to win them. I've just randomly chosen the winner--Mary Louise! Thanks EVERYONE for your interest. Happy Holidays and Season's Readings to you all!